Founded in 1998 in Spello (Umbria), just 10 years later, the Wunderkammern Art Gallery moved to the Rome neighborhood of Torpignattara. The gallery has contributed to revamping the area by inviting its guest artists to realize several public art projects for the neighborhood. That’s why the on-going exhibition, which is always very fascinating, is just the first step of your ‘Wunderkammern experience’: after that, you shouldn’t miss a graffiti hunt through one of the most colourful areas in Rome! 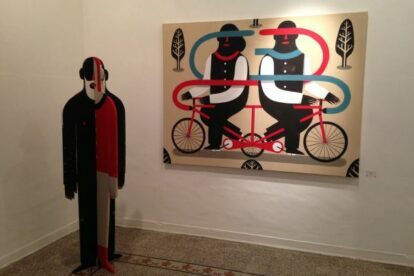 The Wunderkammern art gallery has brought some of the most popular street artists from Italy and abroad to Torpignattara, such as C215, Sam3, Jef Aerosol, Escif, Invader, Agostino Iacurci and Aakash Nihalani. All the exhibitions I’ve attended there were very interesting and the location is no less so: sometimes the exhibition continues in the basement, where the artworks are set up inside former refrigerating rooms (and I can’t help but find it extremely cool! ).